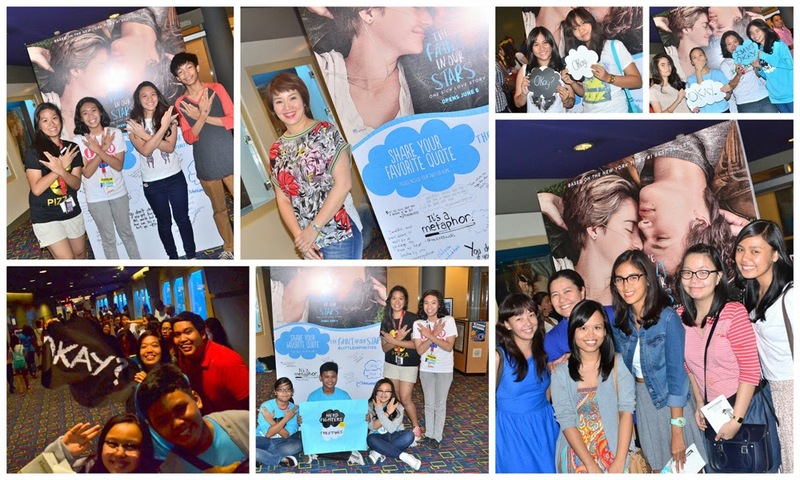 The recently concluded fans day screening dubbed as “Little Infinities” inspired by the book turned movie “The Fault In Our Stars” written by John Green held at Greenbelt 3 cinema is a testament that wishes do come true. From the book’s pages, the genies granted the (Phils.) fans’ wish to watch the movie “The Fault In Our Stars” as early as May 12. From more than 4,000 entries, a total of 120 fans won the most coveted tickets from 20th Century Fox’s online promo where they were randomly chosen. Additionally, presidential sister Kris Aquino and a booklover graced the event and gamely interacted with the rest of the fans and guests invited to the screening. Prior the start of the movie - John Green, musician Ed Sheeran and “The Fault In Our Stars” lead actors Ansel Elgort and Shailene Woodley surprised the audience with their welcome messages and made the fans shriek with delight. “The Fault In Our Stars” introduces us to Hazel and Gus’ journey of forever - two extraordinary teenagers who share an acerbic wit, a disdain for the conventional, and a love that sweeps them -- and us – on an unforgettable journey. Their relationship is all the more miraculous, given that they met and fell in love at a cancer support group. “The Fault In Our Stars,” based upon the number-one bestselling novel by John Green, explores the funny, thrilling and tragic business of being alive and in love. Hazel Grace Lancaster (Shailene Woodley) is sixteen years old. She alternately loves and tolerates her sometimes over-doting parents. Hazel has developed a crushon a young man, Gus Waters (Ansel Elgort), who seems equally smitten with her. As they grow closer, Hazel and Gus share their fears that accompany their health issues, as well as their love of books, including Hazel’s touchstone, An Imperial Affliction. She has tried many times to get in touch with the book’s reclusive author Peter Van Houten (Willem Dafoe), to no avail. When Gus manages to reach Van Houten through the author’s assistant, it results, astonishingly, in an invitation to meet the writer in Amsterdam. Gus is determined to take Hazel on a journey that will answer every question she has ever had about the book that has meant so much to her. “The Fault In Our Stars” opens in cinemas nationwide on June 5 in the Philippines from 20th Century Fox to be distributed by Warner Bros.